When Chinese car manufacturer Geely bought Volvo 8 years ago, there were fears that the ethos of the original Swedish based company would become lost. Not so, Volvo is still turning out well-designed, well-built and desirable motor cars. 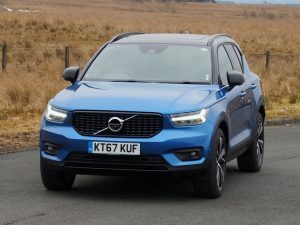 Take the new XC40 compact SUV for instance. In fact, the ‘compact SUV’ description is a bit of a misnomer. This car has a touch of the Tardis about it. For sure it looks quite bijou on the outside but this is a full four/five seater with plenty of head, shoulder and leg room inside. Perhaps the two tone paintwork, sculpted side panels and contrast coloured sill bodywork disguise its external dimensions and deceive the eye. Whatever, it works. This is a very smart looking vehicle. The test car was the T5 AWD version with the 247 bhp version of Volvo’s 4 cylinder 2 litre engine. Six months ago I drove the 2 litre diesel with just under 200 bhp and was impressed, but the extra 50 bhp in this top of the range petrol derivative certainly makes its presence felt. That naturally gives it a fair old turn of speed and it comes as standard with an 8 speed automatic gearbox. 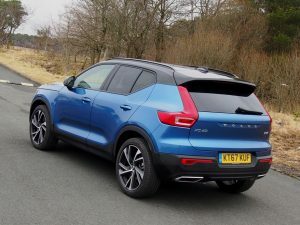 There is no manual option, but I reckon most Volvo customers are happy enough with the more relaxed drive that an automatic transmission provides. Relaxed is the word. As long as you’re not in a hurry, the Japanese/American designed and manufactured auto ‘box works well, but if you try to rush it approaching roundabouts and junctions, it can catch you out. If you are slowing down on the approach to such an obstacle and then spot a gap and try to accelerate into it, the gearbox can sometimes take a second or two to think about it and sort it out. As long as you are aware of that, and just out for a leisurely drive in ECO mode then that’s fine, but if you do want a sharper response shift it into Dynamic mode. This sharpens up gearchanges, engine response, steering and the brakes. It doesn’t transform into a sports car but it does make a difference if you are trying to cut across country in a more spirited fashion. The car generated quite a bit of interest when I drove it to Otterburn for the Cheviot Stages with a few folk coming over to have look around and inside. The camera festooned A68 is no place to have a blast, but coming home through Hawick and the Tweed Valley was however an altogether different matter! The run home was no place to try out the latest ‘Pilot Assist’ semi-autonomous driving technology as fitted to the newest Volvos. This takes a serious step forward in the march towards fully autonomous cars. All the manufacturers are at it these days, adding ever more ‘automatic features’ which make driving safer while giving the driver less to do. It’s a way of getting us used to the technology ahead of the day when we climb into our cars, sit down, open up the newspaper, or the bluidy tablet more like, then sit back while the pre-programmed vehicle takes us to our destination whether in the city centre or halfway down the M6. What ‘Pilot Assist’ offers is a constant eye on traffic ahead and lane discipline. It works with adaptive Cruise Control to maintain the desired cruising speed while adjusting to and working with the traffic flow around it. It’s eerie. It will automatically accelerate and brake matching the traffic flow without the driver having to do anything apart from keep both hands on the wheel. The system is supposedly ‘optimised’ for motorway driving but I waited till the M8 was quiet before trying it. Of course, the system works, but the biggest objection will come from the nation’s auld gits who have been driving for years and refuse to accept that computers and machinery are better than the human touch. Driving used to be one of the great pleasures of life but traffic jams and pot-holes have taken away much of that enjoyment. 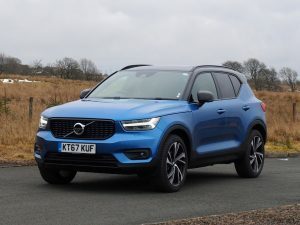 If you are someone who enjoys driving a quick and nimble car, the XC40 still provides that feedback, so drive it now before the robots take over. Besides it’s much nicer to look at than a Dalek.